This product allows you to remove storesprite copyright notices from the front end store and emails generated by your store. Purchase a Copyright Removal Key for your domain name and your web store can be clean of our publicity messages quickly and painlessly. Once you have remitted payment you will be provided with a credit for our code generator into which you will enter your domain name. You will be provided with a key code unique to your store/domain name. Keys are for use with a single domain name / store and are non transferable. If you have any questions about this product, please contact us. Advanced Copyright Removal Key Reduced! This product allows you to remove storesprite copyright notices from the front end store and emails. It also removes remote advertising in the control panel. 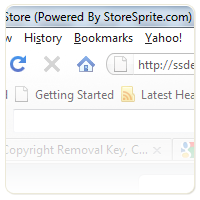 If you are a web designer or reseller you may want to pass storesprite off as your own. This product allows you to remove all trace of us and add your own branding.